This Nigerian robe of honor is made of saki cloth and is painstakingly embroidered. Saki cloth is a traditional strip-weave indigo fabric. 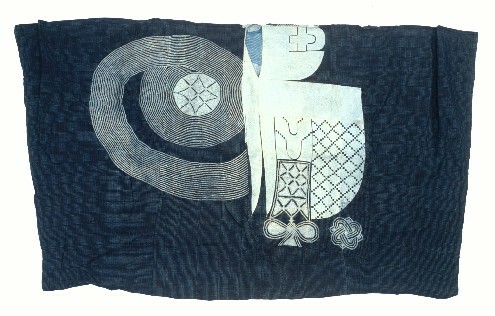 The embroidery depicts the two-knife style particularly popular during the Sokoto Caliphate rule (ca. 1810-1908) in what is now northwestern Nigeria. A two-knife prestige robe once identified the weaver as a representative of the Caliphate administration as well as signifying Islamic political and religious authority. Sometimes underlings were given a robe as a reward and as an offer of protection. The spiral and knife design symbolizes good fortune and victory in war. Today these handmade robes are extremely rare, expensive, and worn only by elderly men. Due to the value of these robes, many were traded throughout the region. Nupe textiles were significant in the prosperity of the region. This fact is supported when one compares this robe with a similar one in the Virginia Museum of Fine Arts. Although they are clearly alike, the museum's robe is identified as being from the Yoruba culture because of where it was found. Men in Yoruba have also been known to wear this type robe. Bibliography: Perani, 1992, pp.92-112; Woodward, 1994, pp.58-59.